Let Handy Manny Party Ideas Fix Your Party Up! Handy Manny party Ideas are Toolrific! 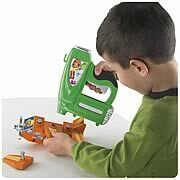 Have Handy Manny fix up your home for the next birthday, holiday or play date. There are so many fun and exciting things to do and Handy Manny games you can play at your next Kids' get-together. Handy Manny Balloons are a great decorating idea! Manny is a bilingual handy man. One of his favorite sayings is "You break it, We fix it." 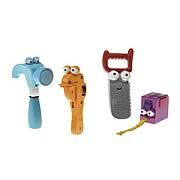 Manny's tools are the co-stars of the show. They each can talk and have very different personalities. Play a Handy Manny game like a tool scavenger hunt or a tool word game. Handy Manny games are the perfect games to play at a Handy Manny theme party. Take a look at the great cupcake decorating ideas we have for a kids birthday party. Handy Manny party ideas need something special in the birthday dessert department! It's easy to make a Handy Manny Cupcake even if you don't know anything about cake and cupcake decorating. Take a look at the pictures and see what I mean! Don’t forget to decorate your party table with a Handy Manny tablecloth and top with party plates, napkins, and cups. You can find some Handy Manny decorations on-line at the Oriental Trading Company You can find all kinds of party supplies, party favor ideas and lots of fun kids craft and game ideas. Make sure to top off the table decorations with Handy Manny party favors! Handy Manny party ideas are not complete without some fun games and activities. Bake the best yellow Handy Manny cake and top it off with birthday cake tool candles or use tool inserts as cupcake decorations. Here's a printable matching game with Handy Manny for your kid's party. Print out enough game sheets for everyone and let the kids help Manny! As the party winds down and it's almost time to go home give each party guest a Goodie Bag full of Handy Manny gifts, such as Handy Manny pencil toppers, stickers, glasses and Kaleidoscopes. 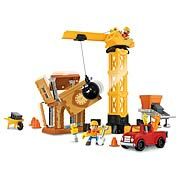 You can find several Handy Manny goodies at www.oriental trading.com. Your Handy Manny party ideas will be a sure hit! 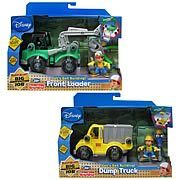 Need some gift ideas for Handy Manny? How about one ofthe Handy Manny DVD's that have been released? Manny has more friends than that and they are tools and people...and even animals like Handy Manny's dog, Fix It. Elliot...Kelly's younger brother who skateboards and plays the drums. Mr. Kumar...a Hindu man who is rather shy. He owns Sheetrock Hills China Shop. Pepe...Handy Manny's nephew who lives with Lola. He plays soccer. There is an entire town of people for you to get to know when you watch Handy Manny on tv or DVD. Kids love this bi-lingual handy man and can learn how to speak a little Spanish while they are having fun watching his show. Use these tools and friends as extra Handy Manny party ideas...use them as a game! Get more Handy Manny party ideas on our Handy Manny Party Supplies page. Handy Manny Party Ideas and Gift Ideas! Handy Manny's Talkin' Tool Box... Manny's Toolbox! Sounds! 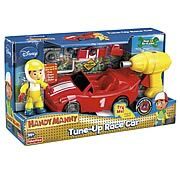 Handy Manny's tool box is loaded with tons of fixing fun! It comes with all 7 tools: Pat, Turner, Dusty, Stretch, Felipe, Squeeze, and Rusty. Take the tools out to help around the house. Put them in the tool box, press the Manny button, and the tools will come to life right before your eyes! Sing along with the Hop Up, Jump In song that Manny and the tools sing when they are ready to go out fixing. It is also jam-packed with great tool phrases! Includes a blueprint that describes the personalities of each of Manny's tools. Requires 3x "AA" batteries. Talking tools from TV's Handy Manny! Saws, tape measurers, hammers, wrenches, and more! Fun colorful tools talk and have play features, but do not actually perform functions. For fun fixing jobs our Tool Packs bring Manny's tool's to life! Each pack comes with 2 tools to help you fix any project. Each pack comes with 1 talking tool and 1 tool with mechanical action features. Pack one has Dusty and Stretch, pack 2 has Rusty and Pat. Each one also comes with a sticker badge and a mini blueprint! Assortment may vary. Case includes 4 individually packaged pieces. 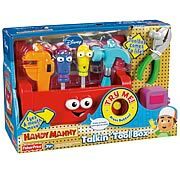 These Handy Manny toys will go perfectly as party gifts with your Handy Manny party ideas. Get more Handy Manny party ideas at our Handy Manny coloring pages. Print out as many Handy Manny coloring pages as you like to entertain your party guests!